As the ‘wish card’ representing the things you want/desire being given to you, I decided to show Anna presenting one of the cups, holding it towards you showing that; yeah, it’s okay – you can totally have this! 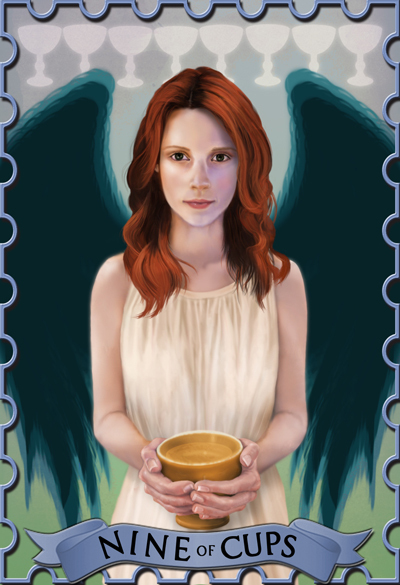 As for other layout choices, the card was looking too cluttered when I tried to fit 8 other fully rendered cups around her so I decided to mirror the representation in the prompts list and place the 8 other cups above her, as if there are multiple possibilities, multiple options. As for Anna herself I hoped I have depicted her as intended: ethereal, kind and positive!